Our office was moved into open-plan last year. There was general apprehension before, quite a bit of settling in during and now, eight months later, I can say that there are good things, getting to know the people we work with better, and plenty of positive things about our new location. But open-plan is just that. Open. People’s task demands and temperaments mean quiet concentration and activity-fix times differ. When you’re needing to concentrate, they’re on a buzz and vice versa. Some people process out loud, others do this on the interior. And noise rules. It’s nice to have the company, the fun and people at hand when you need to ask a question, but to read or think … you need to go elsewhere or work around the hullaballoo with your headphone volume on max. Shake hands with almost daily distress. The office planners of our organisations should become aware of the difference between eustress and distress (Hans Selye, eustress & distress). With the experience of our new open-plan as inspiration, I’ve looked into the phenomena and have found background, common ground but not much neutral ground. Remember that link to TED’s work smarter videos I gave you in the first part of this Thinking Out Loud series? The 11th video is a good one to watch for this topic. It’s Jason Fried’s Why work doesn’t happen at work. Fried thinks that the office isn’t a good place to work. He says he’s asked people where they need to go to get something done and their response is usually a place or location, a moving object or a time. Rarely anyone says the office. He says this is because at the office you don’t have a work day anymore, you have work moments. The workday is shredded into these moments. You get a few minutes here, a few there, someone pulls you aside and asks a question, now it’s time for lunch, and suddenly it’s almost time to go home. And you realise you didn’t get anything done. You may get tasks done but you feel you’ve done nothing meaningful. He talks of work being a phase or stage-based event much like sleep. It takes time to get into it deeply. He’d like to alter the modern office so people would say ‘when I want to get stuff done, I go to the office’. What would this take to achieve? Besides the rationale behind open-plan, e.g. economics and inducing staff to collaborate more, the workplace is set up for a one-size-fits-all and that one-sizer must be a chaos-lover, the kind of person who prefers doing work at a sports arena, in a pub, or at a bus stop. Great lashings of activity, sound bites as thought, continuous interruptions, shredded concentration. I’m exaggerating. Slightly. The ones with attention deficit who are on their way to the toilet but get distracted by doorways. The ones who make up the Monday-morning welcoming committee. The ones debriefing after having just visited the children and the children’s children. And have a phone full of pictures. The ones who don’t find headphones comfortable (assumes there are those who do). The ones who do wear headphones and sing along. The ones who wear headphones and watch funny videos and laugh. The ones just returned still in the undisciplined holiday bubble: bright, gregarious, tanned. The ones who have their phone rings set so that they can hear them over their headphones. They’re the ones who get the most phone calls and are the ones most often not in the office. The one who has a standing desk and rearranges a lot. “The office, especially the North American office, comes in a military, top-down nature,” says Frank Duffy. He says the reaction against the office hierarchy started in Germany with a concept called Burolandschaft, office landscaping. Desks scattered higgledy-piggledy, butting up against each other, clustered in work zones. The layout was said to be based on a study of patterns of communication. The idea was to encourage disclosure, discussion and debate. Or is it all about profit? You can cram more desks and more people into an open area. Or is space the issue? 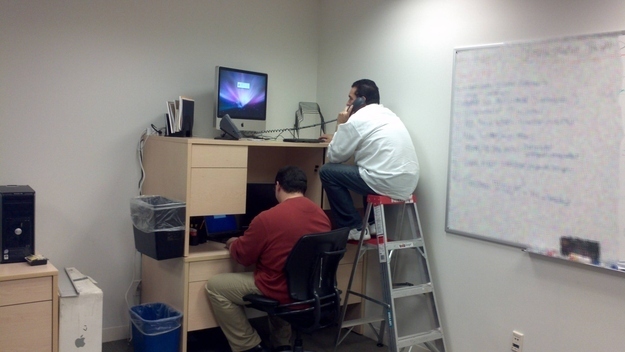 Managers at the top level almost always have their own rooms and often larger spaces than they need. Hierarchy? Image? Incentive? Or do higher-level managers have such bad concentration they can’t work in with the rest of us? Is it control? Profit? Laziness? Lack of alternatives? Status quo? Maybe if we persist with it…? I looked. The arguments against seem to outweigh the arguments in favour. I did, I looked for both sides. Research weighs on the side of open-plan offices having a negative impact on employees’ health and well-being. It does not appear to increase productivity, collaboration and creativity as it’s meant to do. Comments from open-plan office workers interviewed in the 1960s: “We are trapped in a game of continuous idiot salutations”, “We cannot avoid exposure, we see everybody going by. We may see the same person go by 30 times. Now do you invest in a recognition act every time someone goes by? You are distracted and irritated by this exposure overload” (BBC # 23502251). ‘Many studies show that people have shorter and more superficial conversations in open offices because they’re self-conscious about being overheard,’ said Anne-Laure Fayard, a professor of management at the Polytechnic Institute of New York University who has studied open offices. Open-plan, then came dividers, the cubicle culture. Then Dilbert. And A new purpose for Headphones. Headphones are the new walls. You’ll find that even on the street many people are protected by these walls. Sometimes you can hear them. It’s uncanny that the noise others are using to protect their head space becomes your noise pollution. In his 2000 book The European Office, Juriaan van Meel ‘In the UK and North America, by contrast, design is mostly driven by cost rather than worker satisfaction, and open-plan layouts remain the norm (Kremer, BBC #21878739). Social interaction that can increase collaboration is seen to be a rationale for placing people together in an office space. A research article in Harvard Business Review says that a balance of three dimensions is important for encouraging interaction. They are proximity, privacy, and permission (Who moved my cube? Harvard Business Review by Anne-Laure Fayard and John Weeks, July 2011). This Australian review published in 2008 encourages managers to be better informed about embracing an open-plan workplace. (Note: I find that the direct-to-people managers, who care about their staff, often aren’t the ones making the decisions.) Should Health Service Managers Embrace Open-plan Work Environments? : A Review, Oommen, VG; Knowles, M and Zhao, I. [online].Asia Pacific Journal of Health Management, Vol. 3, No. 2, 2008: 37-43. From Cubicles, Cry for Quiet Pierces Office Buzz covers drawbacks and also some rationale from the supporters of cubicle culture (NYTimes, 2010). Blog – The open-plan office: pros and cons by Leon Gettler, the Australian Institute of Management, 9 July 2012. Two things about the modern workplace that really bother me (bother = interrupt my well-being). Interruptions and the idea that multi-tasking produces quality outcome. Interruptions and multi-tasking to me are related. If we are good multi-taskers, we should be able to listen to our colleagues chatter, answer a million questions and still keep our mind on, say, the blog we’re writing about open-plan offices. And it will be well thought out and thorough and have only taken a small part of a day. Interruptions/distractions aren’t just other people interrupting you. You interrupt yourself. Consider Facebook, Twitter, YouTube, TED X, smoker’s breaks, that 3 pm lag when chatting comes easy because you won’t get your work done anyway. But in open-plan, think about how often you are interrupted by other people. Is this more than if you had your own office? Think about it. Jason Fried talks about the M&Ms of interruption: Managers and Meetings. Innovation Hub: Jason Fried on the End of the Workplace. The one who does EVERYTHING all at once. 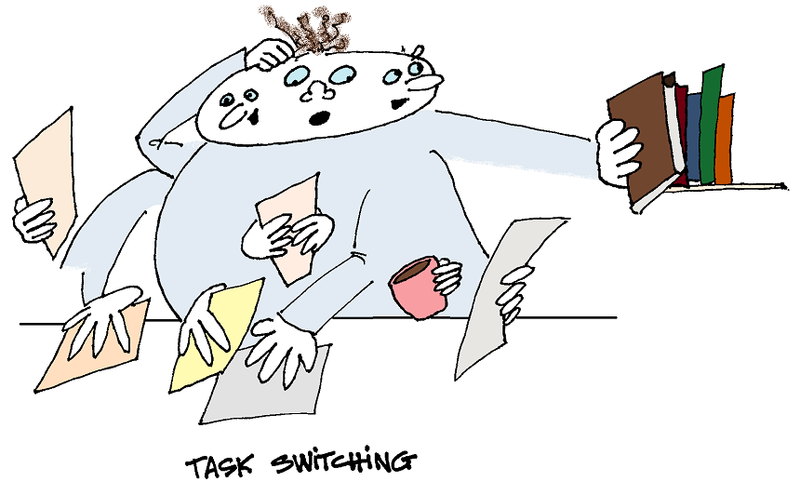 Multi-taskers are good at task switching. They always smile when they’re interrupted and don’t mind if you ask them a million questions about your work while they’re doing theirs. They get heaps more done than non-multis. And they always look so in control. Fact or fiction? Planned silence times during the day. Group-accepted signs/signals (let your office-mates know when you’re ‘in the zone’, ‘plugged in’, needing quiet). Meet in a different room so you don’t disturb others who are working. Phone etiquette. Be aware of others in the office when you’re on the phone. Keep your ring tone turned low, especially when you’re out of the office. Manage your personal mobile so that it doesn’t disturb everybody – make your personal calls elsewhere if they last more than an ‘uha, ok, mmm byeee’. Sound masking. Coloured noise. Mask noise using headphones (certainly not ideal but better than nothing). Studies show some types of noise are more productive than others and some noise can help mask keyboard noises or co-workers’ chatting. I’ve been using pink noise (see Noise resources below for link): a signal that contains a full range of audio frequencies. Rumble noise – like sleeping with your head against the wall in an airplane. Be careful, though, I’ve developed tinnitus since moving into the open-plan office and it may be the headphone dependence, if not the embedded stress of open-plan. ‘If red flags, funny hats and police tape don’t stop your colleagues from invading your space, there’s only one thing for it. Just be really unpleasant’ (The Guardian, Money, Amy Molloy). According to Julian Treasure, ‘You are 1/3rd as productive in an open-plan office as you normally would be.’ TED talk, The 4 ways sound affects us. The Noise Route. The best sounds for getting work done. Pink noise on YouTube (with other colours available on the sidebar). Just for fun, from an album called ‘Playing with pink noise’, Kaki King. See my next blog … the sleep blog and the RECIPE!!! Lebanese-bread pizzas.